I received a bike a couple days ago with none of the hoses to the carbs. does anyone have a diagram of which hoses go where? I don’t have a diagram showing the hoses mounted, but if you post a photo or two I’m sure we can show you where to mount them up. 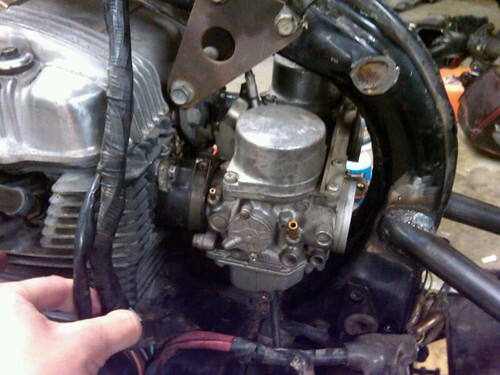 There are a couple small diameter overflow tubes that run from the bottom of the carbs down below the bike. The fuel input is on the left side of carb #1, and the vacuum connection is on the front left side of carb #1. I believe there is a breather on carb #2, but I can’t recall exactly. Post up a picture and I’ll give you some notes. Hey Griswold – looks like that bike has been hardtailed! Did you do any of the fab work yourself? The larger diameter attachment on the right side is the fuel inlet – this should be connected to the fuel flow. The smaller diameter attachment is a vacuum line. Both hoses attach to the stock petcock. However, if you are running some sort of aftermarket or custom tank on your bike it may not have a vacuum operated petcock. If that’s the case just seal up the small vacuum attachment on the carb with a rubber cap, and connect only the fuel. On older bikes (pre 1980ish) there was only a fuel hose from the petcock to the carbs. When the carbs got dirty, or the floats were sticking, fuel would drain and drain and drain, emptying the tank. This would make either a giant mess or would fill the cylinder with gas. This was both dangerous and potentially damaging for the motor. So manufacturers started using vacuum operated petcocks. When the motor is turning over air gets sucked into the carburetor because of vacuum pressures in the intake when the piston travels downward. Some of that intake pressure gets applied to the little vacuum hose. This vacuum opens a rubber diaphragm in the petcock and allows the petcock to release fuel. This means that the only time fuel can come out of the petcock is when the motor is turning over. This prevents bikes sitting in the garage from leaking their fuel everywhere. Personally, I don’t like the vacuum operated petcocks (or anything really). I prefer the old school system. awesome. thanks. And yes it is hardtailed and I’ve done the majority of the fabrication myself. One more quick question. Do you know what size air filter pods fit on the bike? I’ve looked all over the internet and can’t seem to figure it out. Griswold – Just measure the diameter of your carbs where the pods will attach and you’ll have your answer. They’re likely either 48mm or 52mm.